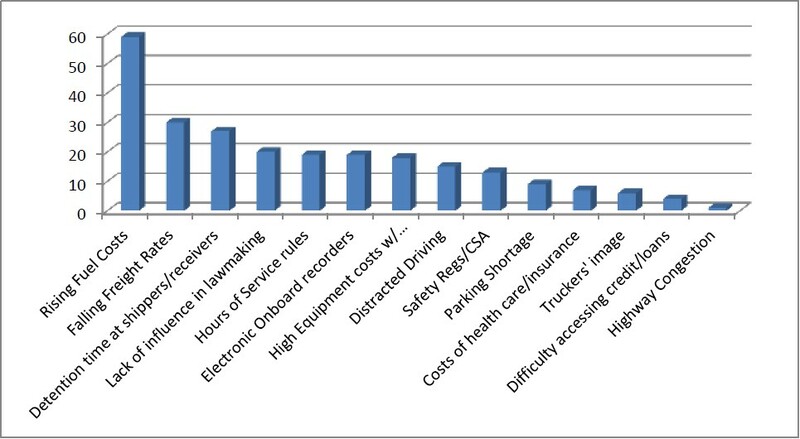 Today I’d like to show you some of the top concerns voiced by owner-operators like you and I. Back in March of 2012, Overdrive Magazine asked owner operators about their biggest trucking concerns. While things have changed since 2012, I find many of the top concerns remained just like before. The top concern in 2012 was “rising cost of fuel” and while this was definitely a hot topic in 2012 with diesel prices hitting $3.968 as a U.S. average, luckily it has steadily come down. I put together the poll responses in Excel and this is what you get in chart form. Click the image to enlarge it. In the posts and emails to follow, I’ll show you which fuel cards to use, how to best fund them, and how to avoid those fast talking sales reps that only care about their commissions. FYI, the week of 7/14/2008, diesel hit a high of $4.764/gal…glad those days are behind us. The next biggest concern for owner operators like you was “Falling Freight Rates”. This is the reason I got into dispatch to begin with. You don’t know much about me, but in a nutshell the only thing I’ve ever done was sales. I was good at it. On the phones I’m one of those likeable guys who could sell ice to an Eskimo. This really comes in handy in dispatch. After dispatching my brother over the road for a while and getting experience, he and I, as well as a handful of our trucker friends realized I was getting better rates than the dispatchers they’ve been paying 10% or more to. I couldn’t understand why people would take a $1.25 load and pay 10% on it. But they did and the dispatchers didn’t mind. This is where I saw an opportunity. Having started our trucking company from scratch, I was involved in it all. All the paperwork, all the regulations, the safety audits, dealing with calls, emails, and faxes. I figured out how to make things efficient, how to talk to these people, build relationships, and generally do things better than the other guys. Pretty soon I had guys calling me with questions and asking for advice. So I started AFT Dispatch, a division of American Freight Trucking, Inc.
There’s only so much one person can handle, so with time I figured, well, if I could train a few guys to do this, we could make a lot of truckers happy. They’d in turn recommended us to their trucker friends and it went on from there. I hope you’ll recommend us to your trucker friends. Over time my goals have evolved to training others to get higher rates and being better dispatchers. We’re learning every day. Thanks for your time, and talk to you later!